So this is result which also contains 'Dataset prices' (pure data from dataset[upper_train + timesteps:]) for clarity. I can not find where I made a mistake (or maybe this approach is bad?) so I will be grateful for any help! Unfortunately it is more likely that this approach itself is bad. It's not the fault of your LSTM or neural netowrk. 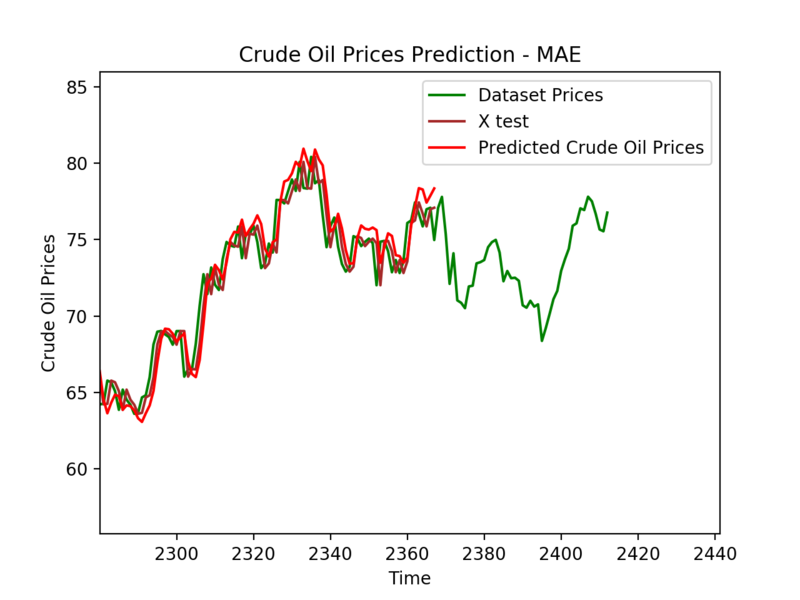 You may be able to find a lot of online tutorials using RNN/LSTM to predict stock price/crude oil price/bitcoin price or whatever price, based on its price history, and their results are almost surely meaningless. Note that I am not saying analyzing a market price is meaningless, but predicting future prices based only on historical prices only is usually meaningless, given that the market is well established and most relevant information influencing its price is readily available; or in other words, the market is efficient. Outside of the domain of data science, the assumptions for the efficient-market hypothesis are not entirely true for most markets, but its consequence is close to the truth for large markets: the asset price follows a random walk. In terms of prediction into the future, the price behaves as a martingale, i.e. the best prediction for tomorrow's price is today's price. Not the answer you're looking for? Browse other questions tagged python time-series lstm forecasting or ask your own question. How to find and use the top features for XGBoost? How to use two different datasets as train and test sets? Are RNN or LSTM appropriate Neural Networks approaches for multivariate time-series regression?